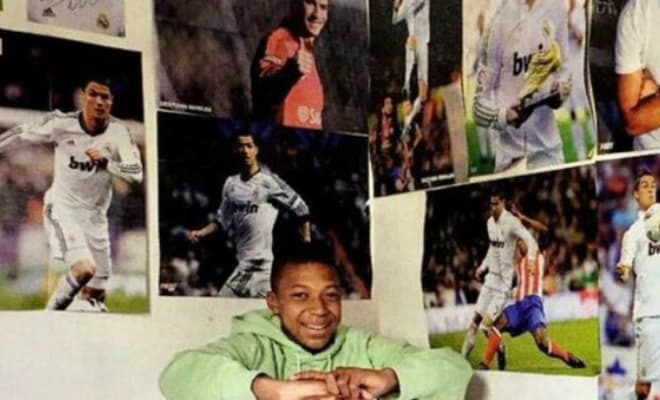 Kylian Mbappé is called the main child prodigy of the football world. At 17 years old the young striker already became champion of France and reached the semifinals of the League. And the most famous clubs on the planet fought for the 18-year-old young man. 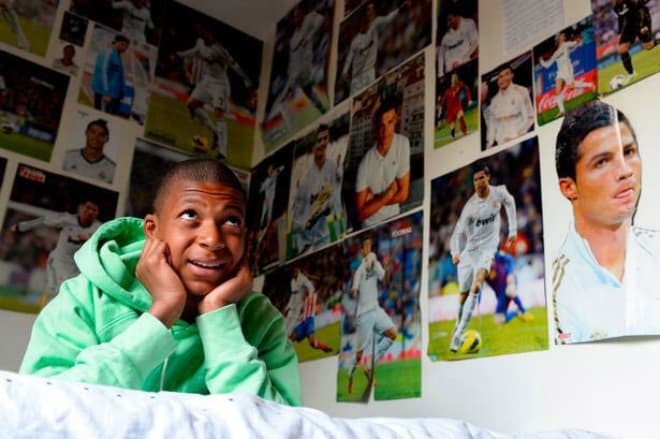 Kylian preferred the French "Paris Saint-Germain," giving up his childhood dream - to play side by side with Lionel Messi. Kylian was born in Bondy, the suburb of Paris. It is difficult to identify the player’s nationality because the parents represent different nations. His father came from Cameroon, and his mother has Arabian roots. Her ancestors immigrated to France from Algeria. Their family loves sports. Kylian’s mother was a professional handball player. His father, Wilfried, played football and then continued his career as a coach at the Bondy FC. Kylian’s stepbrother, Jirès Kembo Ekoko, also connected his life with this kind of sport. Of course, young Kylian also had a talent for the sport. At first, Wilfried coached his son and then sent him to the prestigious academy "Clairefontaine", which "produced" famous football players such as the world champion Thierry Henry and the legendary quarterback of "Barcelona" Lilian Thuram. Both of them finished their football career. The boy lived far from the academy, but his father drove his son for training almost every day. Their efforts were rewarded. When the talented sportsman was 13 years old, the Spanish Real Madrid invited him to the club. Zinedine Zidane asked him to accept the offer. However, the young man refused them. 15-years-old Kylian signed a contract with "Monaco" FC. 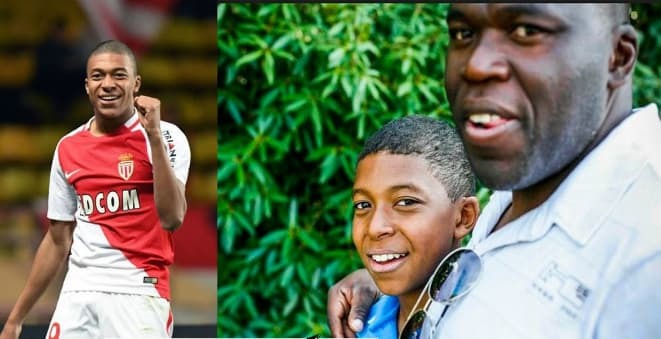 At the age of 15, Kylian Mbappe played for "Monaco"
In an interview Wilfried told about his son: "He not just like football, he is crazy. I have been working in this field for a very long time, but sometimes I get sick of his constant talk about the game. He thinks about it 24 hours seven days a week, can watch four or five matches in a row. " 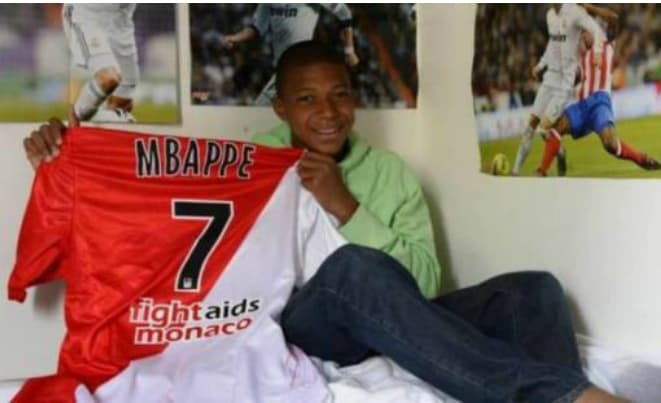 Kylian Mbappe spent two years in the "Monaco" youth team, breaking Thierry Henry’s record, who was the youngest player in the history of the club. 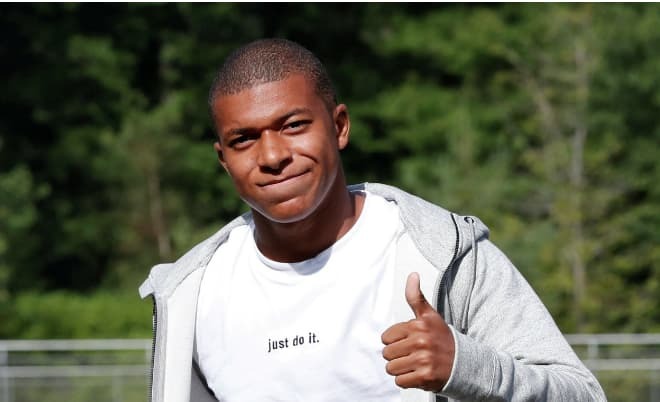 In the debut game he passed the ball, and a year later Kylian scored the most "young" goal. Kylian was not 17 when he began to play with adults, taking the position of the striker. 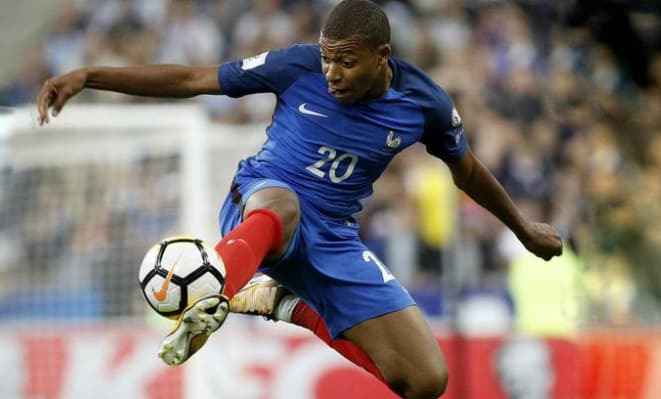 With long-legs, not heavy weight (73 kg) and high speed, Kylian amazed football fans. He played perfectly and most importantly - did not get tired of scoring goals. Mbappé got to the Olympus of French football very quickly. Getting into the main league, he managed to score 26 goals in one season. Thanks to the sportsman the club became the leader of the country, having won "Paris Saint-Germain F.C." 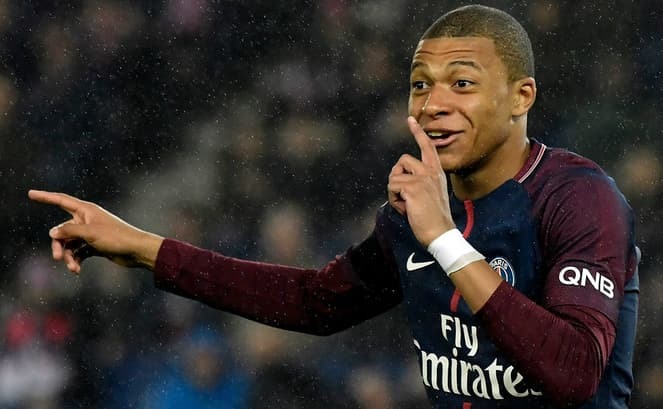 Kylian showed a fantastic game during the Champions League, and people started talking about him in every corner of the world, on Instagram, and Twitter. Millions of football fans followed him on the Instagram. The young striker outraced the brilliant footballer of Manchester City, Nicolás Otamendi, and scored a goal a few minutes before the whistle. All in all, he scored six goals, including the gates of the famous Gianluigi Buffon. He took the second place after Karim Benzema in the ranking of the youngest players ever scored goals in the Champions League. The journalists followed the sportsman and were amazed at Kylian’s modesty. The striker is not arrogant. On the contrary, he diminishes his talents and successes, devalues his awards. He says that it is still far from such football stars as Cristiano Ronaldo, Lionel Messi, and Neymar. In 2017, such clubs as "Barcelona," "Arsenal" (London), and "Real Madrid" as well as Paris Saint-Germain (PSG) fought for the player. The talented striker chose the latter. The reason was simple: he decided not to leave his native country. 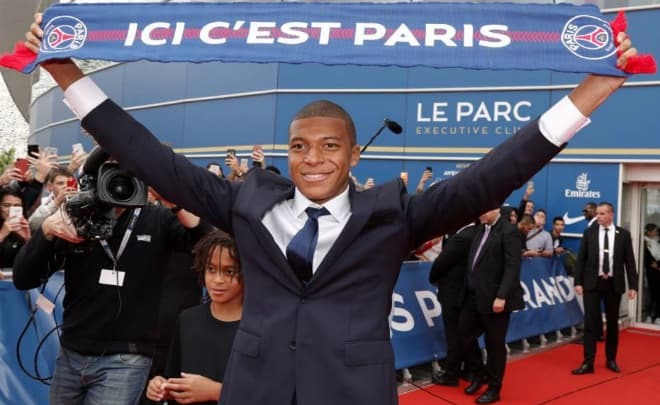 Kylian Mbappe- the striker of "Paris Saint-Germain"
But, according to José María Minella, the FIFA agent, the forward wanted to go to Barcelona to gain experience from Messi. 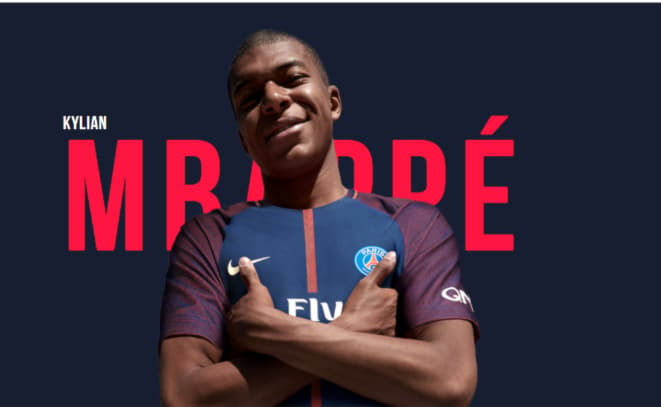 In late August, Paris Saint-Germain announced the signing of Mbappé from Monaco on loan. The transfer fee was € 180 million, and the salary was € 17.5 million per year. The footballer played under the number 29 and immediately turned into one of the leaders of the team. The coach put him on the right flank. At home championships, Kylian scored four goals and passed the ball many times. Since 2015, the young man began to play in the youth teams but didn’t achieve excellent results. The French national team invited Mbappe to their club. He scored his first goal in summer 2017, in qualifying matches for the upcoming World Cup. The young football player doesn’t like to share his private life. It is difficult to find any interesting facts and details about his relations. There were rumors that Kylian was dating the granddaughter of the American actress Grace Kelly. He met Camille Gottlieb at a royal reception. Photographers noted that the young woman only had eyes for the football player. Then a joint photo appeared on the Internet, on which the faces of the couple glow with smiles. There is no other evidence of their relationship. Later there were rumors that the striker began dating Bruna Marquezine, the ex-girlfriend of Neymar. However, the girl told about her relations with another person. Friends of Kylian argue: the young man is single because he has no time for a serious relationship. Only sometimes he invites his friends to play cards and relax. In the season 2017/2018, Kylian showed good results. The young man played in 28 games, scored 13 goals and passed nine balls. The sports star became part of the French national team and went to the World Cup-2018 in Russia. Training began with an injury. Two days before the event, he injured the ankle after a heavy challenge from Adil Rami. Fortunately, the injury was not serious. The team got into Group C, which also included Australia, Denmark, and Peru. On June 16, the French team won Australia with a score of 2: 1. And on June 21, they played against Peru. The only goal was scored by Mbappé. So the team went to the playoff of the championship.